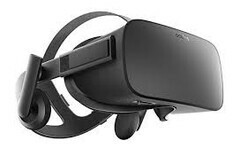 The next Oculus VR headset to be released is rumored to be called the Rift S. The latest leaks on this device suggests that it will come with its own onboard tracking cameras, rather than rely on USB-connected sensors. It may also fix the original Rift's problems with the appearance of 'god rays' on the lenses, and adjust for room lighting with 50-to-60Hz modes. The Oculus Rift is reportedly getting a successor, to be named the Rift S, soon. A new set of rumors, based on code found in the programming for the Facebook-owned VR OEM's interface, hints at this new headset's specs and features. It seems that this model may improve on earlier generations with functions that adjust for room lighting, which could be switched from between 50 to 60Hz in the upcoming hardware. On the other hand, it appears that the Rift S has done away with its predecessor's accommodation for physical inter-pupillary distance (IPD). It is not the first VR set to feature less straightforward software-based IPD adjustments; however, given this highly variable factor that affects object scaling in VR, it is hard to see why this trend persists in the industry. Then again, the putative Rift S may also come with in-built tracking cameras. This upgrade may improve on older systems that depend on extraneous USB sensors. Finally, this possible next-gen headset is also projected to address the 'god ray' issue linked to the previous Rift model, as well as the faulty Constellation tracking system.